The holidays are the time to break all the rules when it comes to eating, right? That philosophy surely might add some fun to the holidays, but long term, it isn't healthy for anyone, especially for seniors, who may already be suffering from poor nutrition. Holidays are a great time for family caregivers to check their senior loved ones for the signs of poor nutrition. Two of five seniors living alone (44 percent) have at least four warning signs of poor nutritional health such as eating alone, taking multiple medications and illness, according to research. Following are warning indicators that a senior could be in trouble. 1. Loneliness. Loneliness can lead to depression, which can make nutritional problems worse. 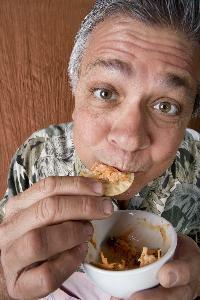 More than three-fourths of seniors who live alone eat alone most of the time. Suggestion: Try to make sure your older loved one has companionship at home or in a congregate meal site. 2. Multiple meds. Nearly 71 percent of seniors take three or more different medications a day. Suggestion: Talk to your senior’s health care team about how medications can impact your older adult’s appetite and discuss with them what to do about it. 3. Healthy staples. Important staples for a good diet are not always found in a senior’s kitchen. Nearly half of seniors who live alone consume few fruits, vegetables or milk products. Suggestion: Talk with your older loved one about their favorite recipes – or yours – that incorporate healthy products. 4. Illness. Many older adults are struggling with health conditions. Some don’t feel like eating as a result. Others say that an illness or condition has forced them to change the food they eat. Suggestion: Discovering favorite recipes from the recipe box and making mealtime a social event may help. 5. Physical problems. A fourth of seniors who live alone can’t always get to the grocery store, nor can they shop or cook for themselves. Suggestion: Try to tap into neighbors and compassionate friends, or arrange for a caregiver to prepare meals. Check out local meals-on-wheels programs. Cook extra at mealtimes and take it to older adults who live alone. 6. Food Storage. Check out expiration dates of food in the refrigerator and freezer when you’re visiting a loved one. Suggestion: Help a senior by packaging food in small portions and labeling in big letters with the date. 7. Important details. When you’re visiting a senior, check out things like skin tone – it should be healthy looking and well-hydrated – as well as any weight fluctuations. A loss or gain of 10 pounds in six months could be a sign of trouble. Suggestion: A visit to the doctor can help ensure your senior is healthy.